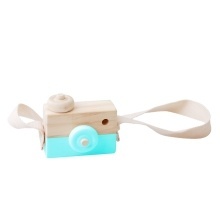 Super cute wooden camera toy for your children. Made of wood, environmentally friendly and harmless, it will be a good gift for your kids. Made of wood, environmentally friendly and harmless. Neck hanging design for easy and convenient carrying. Can be used for photography props, as well as home decoration. Smooth surface, comfortable touch feeling, a good gift for your kids. Super cute and new design, your kids will like it very much. 1. Due to the different monitors and light effects, the actual color of the product maybe slightly different from the picture color. 2. Please allow slight dimension difference due to manual measurement, thank you for your understanding.